Update your traditional pasta salad with a fresh lemon-herb vinaigrette. There are times during the summer when it's just too darn hot to cook or even think about recipes—all you want is a simple supper solution. 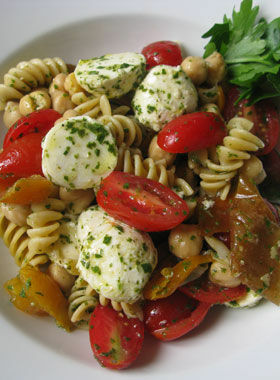 One of my favorite "no recipe required" go-to dishes for summer is pasta salad. It's an easy way to use up just about any fresh veggies you have in the fridge and leftovers are perfect to pack for lunch the next day. To update your pasta salad a bit, I'm going to share a simple trick of mine. Instead of the usual Italian vinaigrette or mayo based dressing, I like to dress my salad with a fresh lemon-herb vinaigrette. The beauty of this vinaigrette is it's adaptable to any combination of leafy herbs you may have on hand (or have in your garden). Fresh lemon adds a tangy brightness that's perfect on hot summer days. I often make this quick vinaigrette as a way to use up bits of herbs I have hanging around from other recipes—you'll find just about any combination of herbs works. It keeps for up to five days in the fridge and is equally delicious drizzled on grilled veggies, sliced tomatoes, grilled chicken or fish, or used to dress green salads. You can absolutely add some diced cooked chicken or shrimp to your pasta salad but it's not really necessary. This dish is substantial enough to satisfy even the carnivores in your life and is great way to eat more veggies or try out "Meatless Mondays." Use one of the many whole wheat and whole grain pastas available to up your fiber and toss in some rinsed canned beans for a complete protein. I use a ratio of 2 cups cooked pasta, 2 cups veggies, 1 cup beans, and 1 cup cheese for a balanced mix of flavors and textures. Have fun playing around with this "no-recipe" recipe this summer to find your favorite combination! Julie Hartigan left a career as an engineer/tech consultant to pursue her long-standing dream of attending culinary school. A fun loving person and natural born teacher, she loves her new career and sharing what she's learned with others. Julie currently develops recipes, writes, and blogs about cooking, health, and entertaining for Weight Watchers, Bed Bath Beyond, and others. She teaches healthy cooking classes for adults and children, has been a personal chef, and has also worked at Saveur magazine and Food Network. Part gym rat, part party girl, her approach to cooking and life is finding the sweet spot: "Where Healthy Meets Happy". Julie lives in Hoboken, NJ with her two little girls, two chubby guinea pigs, and an extremely patient husband. For more healthy cooking ideas and recipes follow Julie on Twitter @cookingwjulie and check out her Weight Watchers blog: "What's Cooking with Julie".